We hit the road this week to travel all the way to the west side of Lancaster city to record with the band Kheris in their garage rehearsal studio. The release of their new album, The World Outside, coincides with the release of this episode of The Lancast. The members of Kheris are Steve Slesser, Keith Slesser (Steve and Keith are brothers), Aaron Gagne, Rob Nye, and Kyle Kettering. This episode includes a live performance (the poor mixing is our fault) and the studio version of “Angel” from their new album. Kheris will be performing in Lancaster on Sunday, August 22nd with The Sketties. Watch their MySpace page for more information. Also, be sure to listen to the most recent episode of Around the Wood Stove, another podcast produced here in Lancaster. 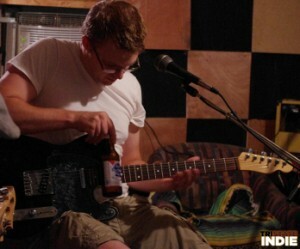 Jason Mundock interviews us about The Lancast and the podcasting scene in Lancaster County. Support for this episode of The Lancast has been provided by Lancaster County Art Association with special thanks to Tri State Indie. Great show and I'm really looking forward to digging into the new album...although, it's a bit disappointing to hear about the inevitable end of the band. Sounds like you're going out with a bang, though.